Picture - An ex-Finnish Air Force Gloster Gauntlet Mk II, GT-400, at Kymi Airfield Aviation Museum. At some stage, this aircraft has been fitted with a new engine in a longer cowling, and a three bladed variable pitch propeller. The British Gloster Gauntlet was a single-seat, biplane fighter of the RAF designed and built by Gloster Aircraft in the 1930s. 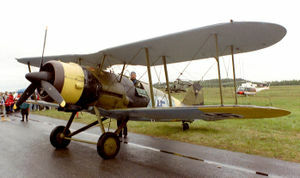 It was the last RAF fighter to have an open cockpit and the penultimate biplane fighter in service. The Gloster SS.18 first flew in January 1929. The Gauntlet was a development of the Gloster S.S.19B design, the S.S.19 prototype being re-engined with a Bristol Mercury VIS engine, first flying in this form in 1933 . On testing the S.S.19, the Air Ministry placed an order for 24 aircraft in September 1933, to be named the "Gauntlet". This initial order was followed up with orders for the revised Gauntlet Mk. II. This new model used a revised construction method based on that used by Hawker following Hawker's takeover of Gloster, as this was much easer to build and repair than Gloster's welded structure . A total of 204 Mk IIs were produced in the UK. The Gauntlet Mk. I first entered service with No 19 Squadron at RAF Duxford in May 1935. The Gauntlet proved successful and popular in operational service, having a large margin of performance over the aircraft it replaced (i.e. the Bristol Bulldog, over which the Gauntlet had a 56 mph (90 km/h) advantage in speed ) to form the main part of the RAF's fighter strength. The Gauntlet was the fastest aircraft in the RAF from 1935 to 1937 . The Gauntlet Mk II entered service with 56 Squadron and 111 Squadron in May 1936, a further six squadrons being re-equipped with the Gauntlet by the end of the year. At the height of its career, the Gauntlet equipped a total of 14 Squadrons of RAF Fighter Command . No. 32 (The Royal) Squadron RAF Gauntlets were used in early trials of ground direction of fighters by radar. As more advanced fighters, such as the Gloster Gladiator, Hawker Hurricane and Supermarine Spitfire started to re-equip the Gauntlet squadrons in 1936 and 1937, the surplus Gauntlets were passed on to freshly formed units as their first equipment to allow then to gain training before receiving more modern fighters. Gauntlets were also shipped to the Middle East, equipping three RAF squadrons. All home based Gauntlet squadrons had re-equipped with more modern fighters by the start of the Second World War, but remained in service in the Middle East for longer, with a flight of Gauntlets remaining in service with No.3 Sqn RAAF in the Middle East when Italy declared war in 1940. These were briefly used for ground attack operations against the Italians before being retired from operations owing to maintenance problems. Gauntlets continued in use for meteorological flights until 1943 . Seventeen Gauntlets IIs were licence produced in Denmark, while 25 ex-RAF machines were supplied by South Africa as support to Finland in 1940 as a result of the Winter War. Already obsolete, they were used as advanced trainers by the Finns. The Finnish nickname for the Gauntlet was Kotletti (literally "cutlet"). SS.19A : The SS.19 was later fitted with two wheel spats, and a single spatted tailwheel. Gauntlet Mk II : Single-seat fighter aircraft; modified version of the Gauntlet Mk I. 221 built.